A large majority of lighting designers do not understand the importance of hiding the light source in such a way that the viewer experiences the effect without suffering the distracting glare of the light itself. Whatever technique we use, our goal is to make the light source unobtrusive, so that you and your guests enjoy the illumination effect, without being blinded by the light source. This subtle technique is one of Aesthetic Lighting's signature design styles - a style that places us above most other outdoor lighting companies. There are many different ways that we can achieve your objectives. We are specialists at deftly interpreting your outdoor lighting desires, all-the-while taking into consideration your preferences, needs, and budget. The choices you make in illuminating the exterior and grounds of your project are no less important than those made regarding your architect and builder/general contractor. 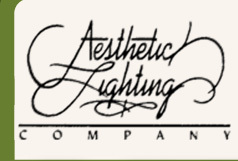 Aesthetic Lighting can and will deliver consultation, design, and installation of systems that will present your home or business "in its best light." This general term merely means that the light source points in a downward direction, illuminating the desired area or object from above. This is a type of Downlighting. 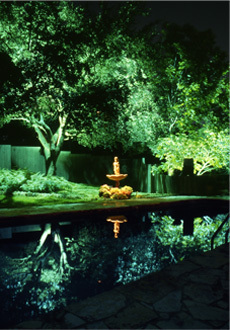 By placing fixtures very high in your trees, we aspire to simulate moonlight. The type of light bulb used is also an important factor in achieving this effect. The luminescence is softly diffused, creating a magical environment, casting interesting patterns of light and shadows that play along the ground. True to its name, Moonlighting provides an enchanting and alluring "kiss" to the rest of the lightscape we design for you. Although moonlighting, with it's soft luminescence, does provide a safer environment, floodlights to be used in the event of an emergency can be installed unobtrusively and on seperate switches where they can be easily accessed from within your home. This brighter task lighting illuminates playgrounds, grill areas, patios, or whatever area in which you need extra illumination. This is the primary lighting tool that, when used, highlights the facade of your home or building, or trees and shrubs in your garden. This is used to specifically draw focal attention to an object in your garden such as a statue or water feature. 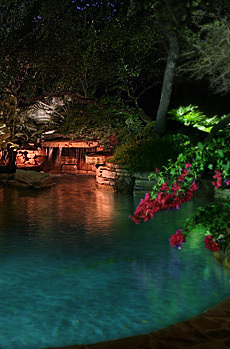 Accent Lighting brings a dramatic focus to a special piece of art or architectural element. This form of low level lighting is used for paths and stairs when the illumination from above is insufficient. Also, it may be used simply to offer variance in the overall lighting scheme. Since the light fixture itself is a focal point, it is designed to look attractive in the daytime as well as at night. The selections and variations are practically endless.